I love my job. It is truly a gift, to be able to dedicate your life to something that inspires you, makes you look forward to getting up in the morning, sparks your creativity and motivates you to be the best at what you do, every single day. But up until recently, that wasn’t always the case. I’ve had a long history of jobs I either hated or didn’t care about, jobs that stole my energy, my time and my soul, just so I could pay my bills and “live.” But all that began to change when I decided to get serious about my writing and pursue it professionally, and then more recently, when I made the choice to stop wasting my talent writing about topics I didn’t care about and focus on my greatest passions – dogs and animal welfare. Still, what I write about often isn’t easy for me. In fact, covering these stories can be downright heartbreaking. Animals are still so abused and exploited in our society, in our selectively animal-loving society. That’s because we humans suffer from a hard case of “speciesism.” We love our dogs and cats, but we disregard the lives and rights of farm animals, those used in scientific experiments, for clothing or entertainment – anything that benefits us humans. Then there are those who neglect their own pets, treating them as objects to do with as they please rather than as cherished members of their family. I don’t know how those people even sleep at night. And that’s what leads me to my story. It starts out sad, but bear with me, it gets better. 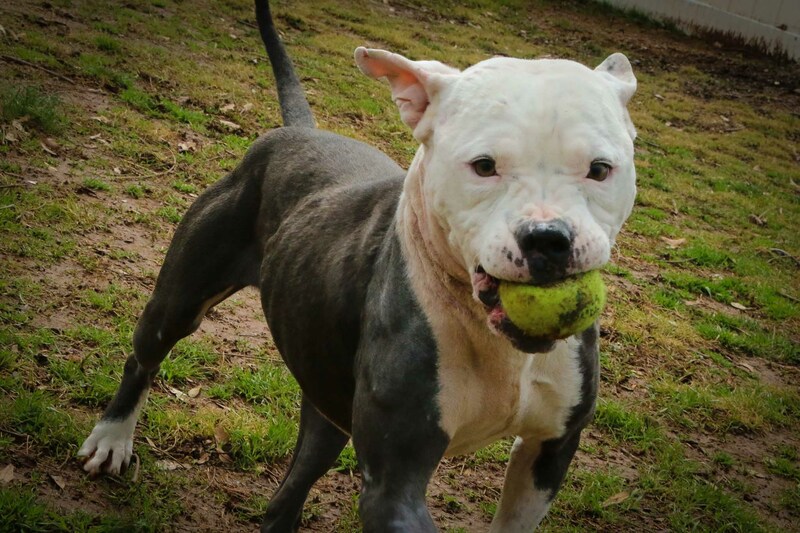 It’s all about a lovable pit bull that was rescued from the cruel underworld of dogfighting and is now looking for the perfect forever home. It’s one of those tales that inspires me to spring out of bed in the morning (okay, maybe I don’t “spring,” exactly) and rush to my computer so I can write an article that might make a difference in the life of a very deserving animal. I am a huge fan of Angels Among Us Pet Rescue, a non-profit charitable organization dedicated to saving companion animals from high-kill shelters here in Georgia. They do amazing work and are tireless in their passion and determination to rescue and rehabilitate every single dog or cat they can possibly help, then adopt out into loving homes. 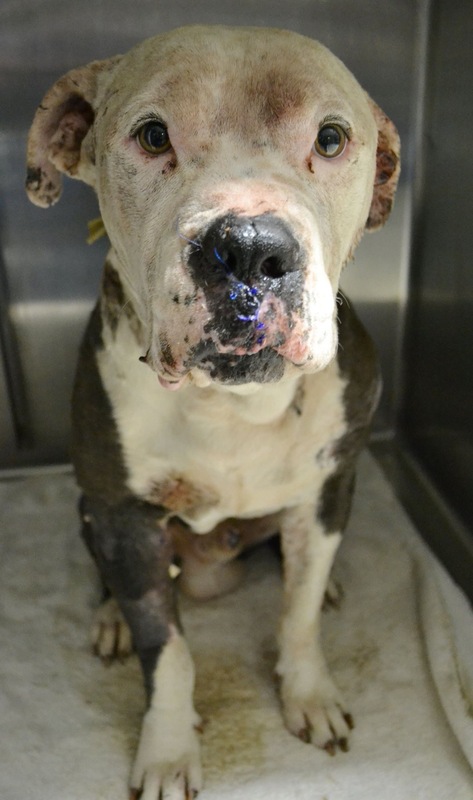 A little over a month ago Fulton County Animal Services received an anonymous call about a pit bull that had been hit by a car and left for dead by the side of a road in Atlanta. 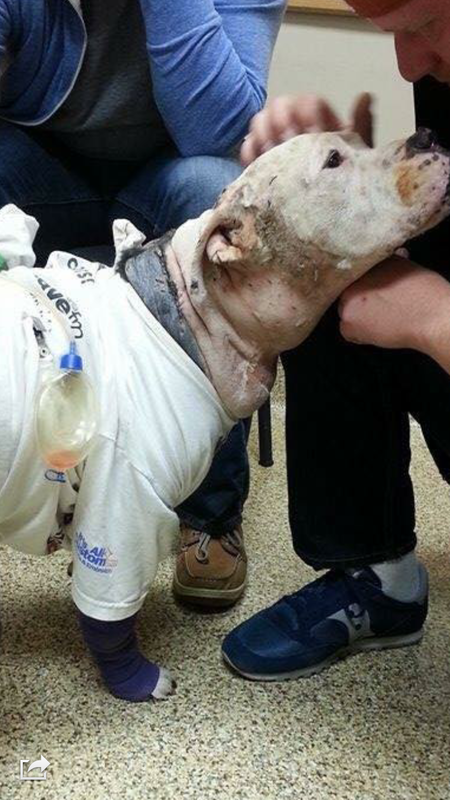 When dispatch went to retrieve the injured dog, they realized that his wounds were not consistent with a car accident, but with dogfighting. 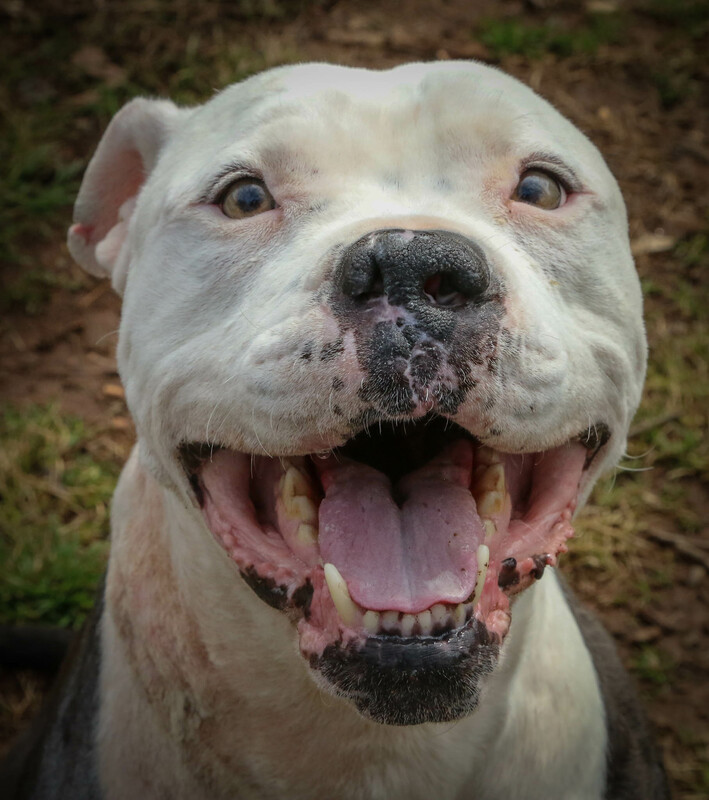 They immediately reached out to Cris Folchitto, who is a full-time AAU volunteer and foster with many years of experience working with bully breeds and ex-fighting dogs. 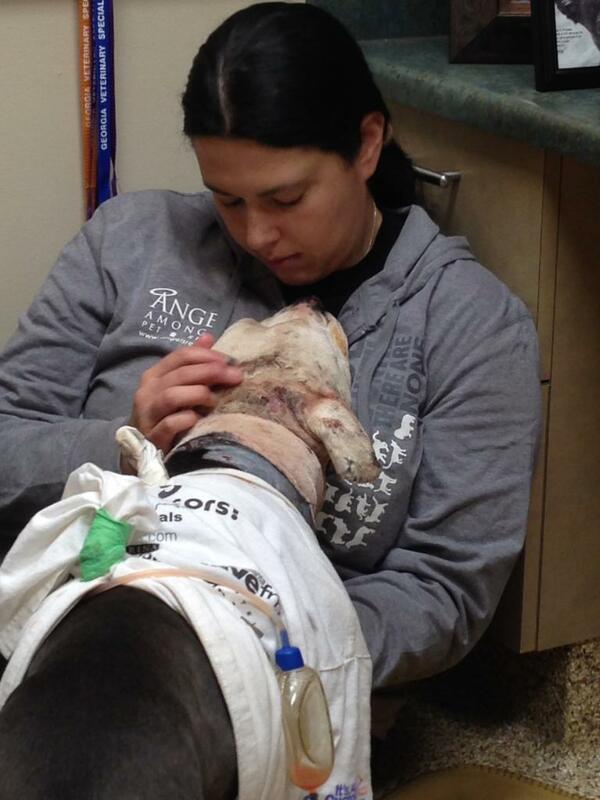 She quickly became the pit bull’s advocate and has been there for him ever since. I’ll spare you all the graphic details about the dog’s myriad wounds, medical procedures and rehabilitation (I think the images below say it all), but suffice it to say that the amazing veterinary professionals at Georgia Veterinary Specialists and Chattahoochee Animal Clinic worked wonders piecing the poor pup back together and essentially saving his life. And Cris has done an incredible job helping this sweet canine go from an abuse victim to a happy, loving and playful guy who is ready to spend the rest of his life as a beloved companion. 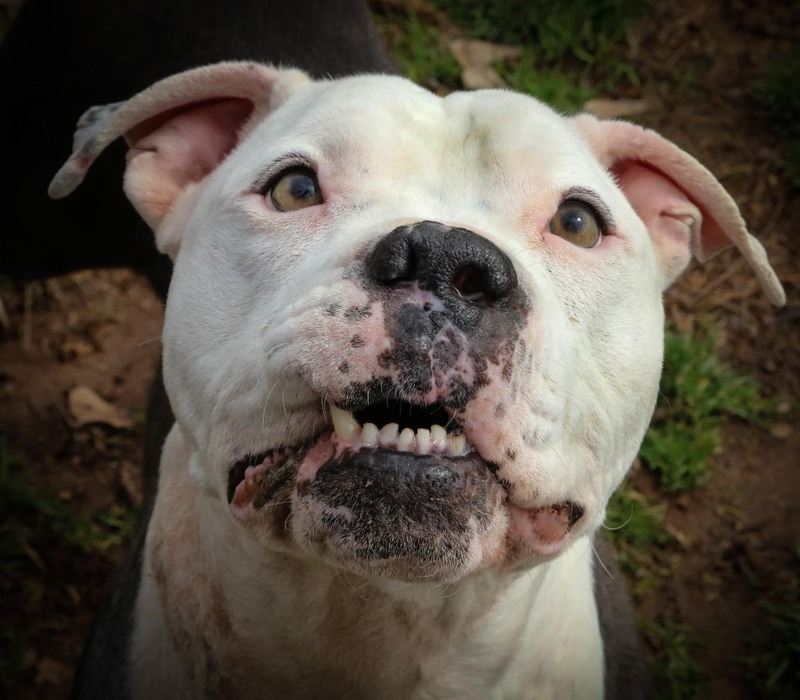 I had the chance to visit Daijon (his name means “pillar of strength”) and Cris last week at the clinic, where the goofy pit bull has become a staff favorite, charming anyone who comes near him – including me! Watching him bounding across the yard in fast pursuit of the tennis ball Cris was throwing for him, you’d never suspect that this playful hunk had been on the brink of death just a month before. 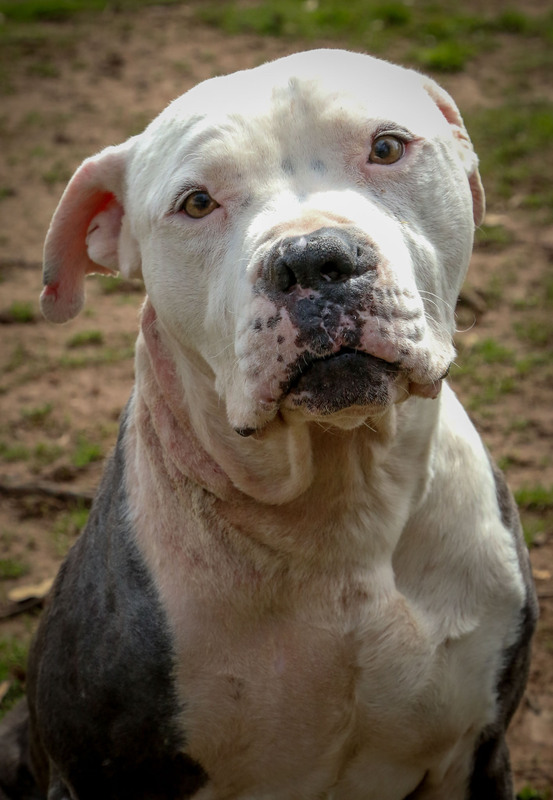 Though he still wears the battle scars of a life of abuse, his wounds are healing well, his body is filling out, and he possesses an infectious, playful energy that is incredibly touching and irresistible. After everything he’s been through, it’s amazing how loving and trusting he is toward humans and how eager he is for any affection they’ll show him. As we took turns playing and cuddling with Daijon, I asked Cris why she has devoted so much of her life to rescuing, fostering, training and rehabilitating bully breeds and what makes these dogs so special to her. As the most euthanized, neglected and mistreated breed of dog due to their unfortunate association with a subculture that has used, abused and overbred them, pit bulls have definitely been given a reputation they don’t deserve. Forgiving, resilient, smart and loyal, they are eager to please, often the easiest to train and make amazing family companions, said Cris. As Daijon showered my face with sweet kisses, I agreed that while there may be exceptions – any mistreated or un-socialized dog can become aggressive and dangerous – it’s the humans that are the problem, not any specific breed of dog. While all 50 states have enacted anti-dogfighting laws, this cruel practice still continues throughout the country. Cris told me that in Georgia, dogfighting occurs mostly in rural areas or in less economically advantaged parts of Atlanta, where dogfights are typically held in abandoned warehouses or buildings under the cover of darkness. So what will it take to finally stop this barbaric blood sport once and for all? Harsher penalties and prison sentences for dogfighters, both spectators and organizers. More animal welfare investigators in the field. Banning backyard breeding (the primary source of dog procurement for fighting and bait dogs) and making sure that only licensed breeders can sell dogs that must be spayed or neutered before delivered to their new owners. Making sure that shelters thoroughly screen potential adopters, have statewide “Do Not Adopt To” lists that they follow, and spay or neuter all animals before they leave the shelter. Watching Daijon devour his dog biscuits with relish, I asked Cris to describe his perfect home. While she admitted she would adopt Daijon in a heartbeat if she didn’t already have 12 dogs at home, four of them fosters (and I thought parenting three dogs was a lot of work! ), Cris said that Daijon deserved a loving home where he could either be the only dog or live in a family with other young, balanced dogs who could help him burn off his enthusiastic energy. I’ve never shared my life with a pit bull or any bully breed before, as I’m sort of a diehard German shepherd and pug devotee, but after meeting such a special soul as Daijon, I think I might consider rescuing a pit bull someday. While he won’t be coming home with me, I know he’ll find the perfect situation with the right person. After all, this sweet, courageous boy has been through so much, he truly deserves the best life any loving human being could possibly give him. And in the end, Daijon is just further proof that dogs truly are the most resilient, loyal and forgiving creatures with such an innate ability to move forward and live in the present. We humans could really learn so much from them. 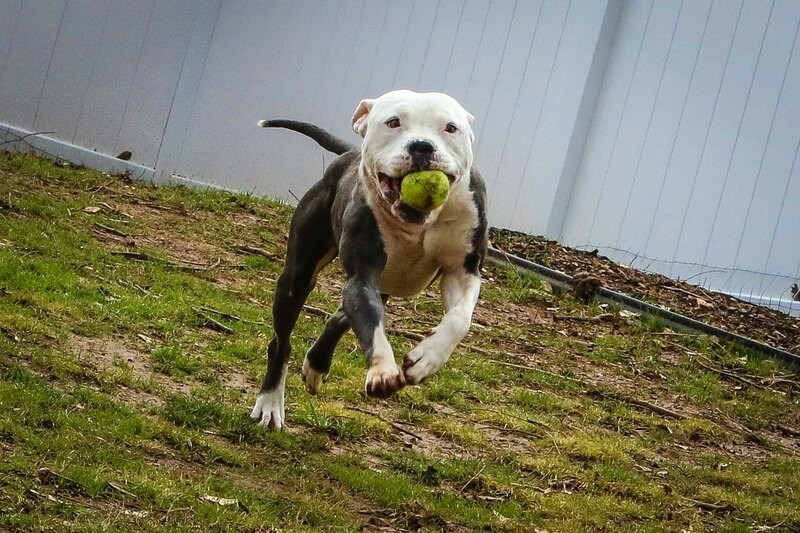 If you live in Georgia and think Daijon could be the perfect lifetime companion for you, please contact Angels Among Us Pet Rescue and fill out an application. You can also learn more about this amazing organization by visiting their Facebook page. This entry was tagged angles among us pet rescue, animal cruelty, animal welfare, dog adoption, dog fighting, dog rescue. Bookmark the permalink. Thank you for your love of animals and for writing about the plight of misunderstood pitties. I adopted a sweet tiny from Angels. That adoption started me fostering for Angels. Now, I have three adopted Angels, and I volunteer with the organization. And while it is both heartbreaking and rewarding, I’ve never looked back; I just wish I could do more! Thank you for your beautiful, heart warming and eloquent story about Daijon. I have been fortunate to meet him at adoptions, but your story brings even more of his history to heart. Also a big thank you to Chris for restoring his faith and there are good people deserving of his loyalty and love. I did the initial temperament evaluation on this pup, and boy is he a sweet forgiving man. Very sound temperment, and all the proper drives to teach him anything in the world. I wish you he best my friend!